So, I wrote a play. I didn’t exactly plan to do this. I’m a theatre nerd, and I’ve done lots of acting, and I’ve written lots of fiction about characters who are fellow theatre nerds (see DREAMERS OFTEN LIE, “A Midwinter Night’s Dream” in STARRY-EYED…), and a few years ago I wrote a play for kids called “Under the Bed” that was premiered by a local middle school. But I’d never really thought about writing a play for adults. And then, a few years ago, during the polar vortex, this idea hit me. And I knew this wasn’t a book or a story idea. This idea was play-shaped. It was about a bunch of small town Minnesotans, trapped indoors by a climate change-driven Ice Age, trying to deal with their new reality without completely losing their minds. I wrote several pages, and then I got busy with a bunch of other things–having a baby, releasing a book, writing a couple more books, blah blah blah. And then the presidential election happened. I finished the play within a few weeks. That climate change–that even basic scientific fact–has become politicized seems crazy to me. But here we are. And when we can’t agree on facts, even the most basic ones, what kind of discussions can we have? How will we all deal with what’s happening to our environment when we can’t ignore it anymore? With science? Religion? Anger? Denial? Knitting and crafting? Lots of beer? I guess that’s what I wanted to explore onstage with SNOW DAY. 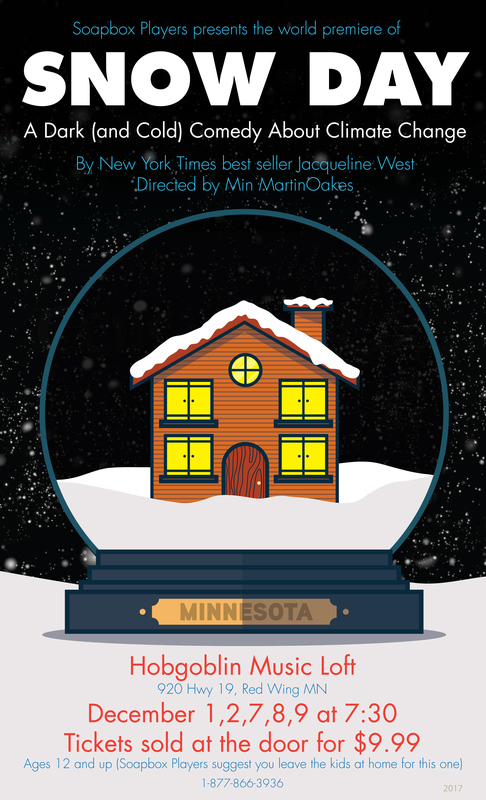 The play opens here in Red Wing, MN next week — and I couldn’t be more excited. Soapbox Players is putting it on at Hobgoblin Music Loft at Stoney End. Shows are at 7:30 p.m. on December 1, 2, 7, 8, and 9; tickets sold at the door.